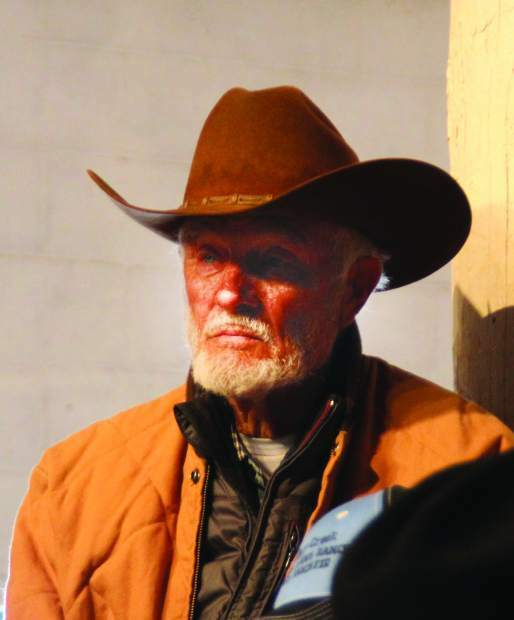 Earl Brunson, Fairburn, SD purchased Lehrkamp Livestock bulls. 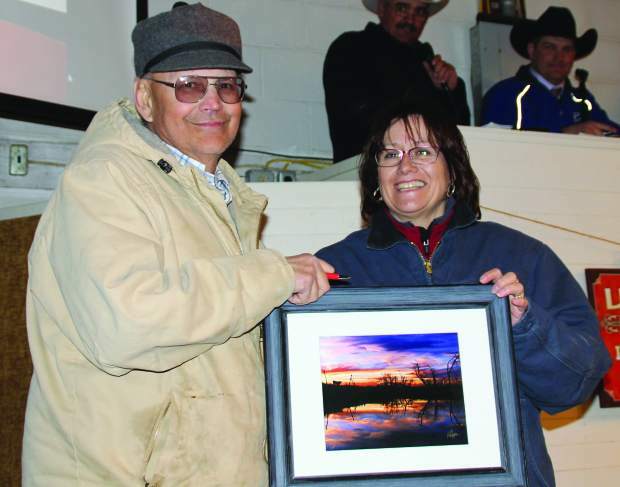 Gary and Diane Sandage, Sandage Angus, Gordon, NE receiving a framed photo from sale hosts Jodi and Mike Lehrkamp. 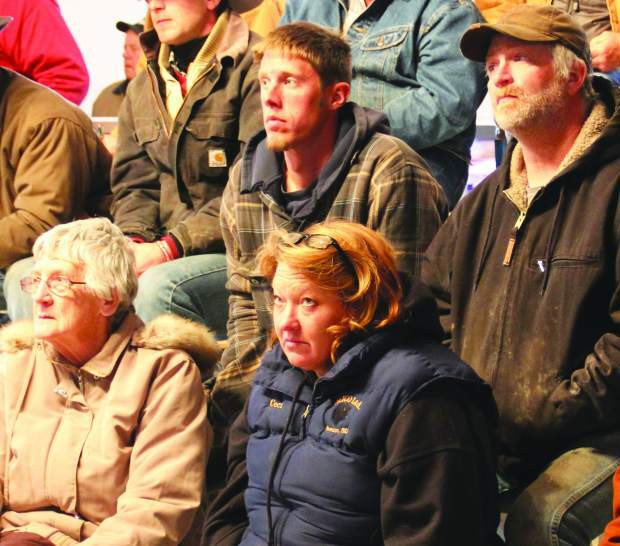 Dayco Ranch LTD, Scenic, SD, purchased bulls and heifers at the 40th Annual Lehrkamp Livestock sale. Lehrkamp Livestock held their 40th annual production sale on April 14, 2013, at the ranch near Caputa, SD. 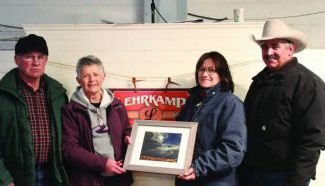 Lehrkamp Livestock is owned and operated by Mike and Jodie Lehrkamp and family. 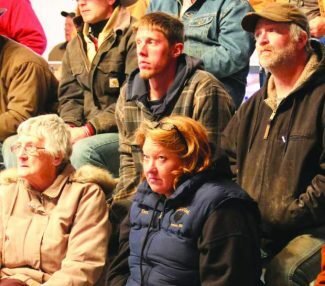 There was a very nice crowd of new and repeat buyers that braved the windy, cold, blustery day to fill the seats for the sale. These bulls were in great working condition; they had been fed and developed to handle any environment. These bulls were deep-made with natural thickness and great dispositions. There was a mix of sires in the offering, giving buyers plenty of options from calving ease to growth. Topping the sale was lot 205, LL Roundup 205, a 2/7/12 son of 21AR Roundup 7005 with EPDs of BW 2.7, WW 60, YW 97, Milk 21. This bull was purchased by Sandage Angus, Gordon, NE, for $5,000. Lot 241, LL Pendleton 241, a 2/27/12 son of DB Pendleton 021 with EPDs of BW -2.6, WW 35, YW 72, Milk 27 sold to Dayco Ranch, LTD., Scenic, SD, for $3,500. The next high selling bull for the day was lot 201, LL Forward 201, a 2/1/12 son of Connealy Forward with EPDs of BW -0.3, WW 55, YW 103, Milk 30. Solberg Farms, Highmore, SD, was the buyer at $3,250. Lot 2123, LL Enterprise 2123, a 3/13/12 son of Double W Enterprise U245 with EPDs of BW 0, WW 43, YW 83, Milk 26 sold to Bonenberger Ranch, Belvidere, SD for $3,200. Also selling for $3,200 was lot 2162, LL Aberdeen 2162, a 3/30/12 son of DB Aberdeen 9125 with EPDs of BW 0.3, WW 49, YW 84, Milk 32. This bull was purchased by Jim and Denise Baker, Hermosa, SD. The top selling Registered heifer for the day was lot 284, LL Madame Pendleton 284, a 3/6/12 son of DB Pendleton 021 with EPDs of BW -1.7, WW 47, YW 88, Milk 27. This heifer was sold to Dayco Ranch, LTD, Inc., for $1,300.